Once you've got a nice turning blank spinning on the wood lathe, you'll want to shape it by holding something sharp to it. We're only getting started with woodturning, but as we learn this page will grow with information about various forms of turning tools (a multi-photo imagemap will be nice for easy navigation). not a Formröhre: mostly rectangular when seen from above, no "nose"
that could use proper sharpening. Gouges are perhaps the most frequently used woodturning tools and are very useful to get your workpiece round in the first place. We only have a very uncharacteristic gouge at the moment. There are several specialized types including roughing, spindle and bowl gouges, all of which may be sharpened at different angles to produce an even bigger variety. This article may help you with your first attempts of using a spindle roughing gouge. Roughing gouges take the same shaving across their entire cutting edge so it's a good idea to keep slowly twisting the tool to balance the wear over the entire edge (otherwise you'll quickly have a dull spot in the middle while the sides are still sharp). We do NOT have a shared roughing gouge yet, but you're welcome to bring one! Called "Formröhren" in German, these gouges are okay for rounding a spindle if you don't have a proper roughing gouge but are more suited for forming cuts in an already round workpiece. Bowl gouges are most aggressive at the sides, so you should avoid to contact the workpiece with the entire bevel. Instead, they are somewhat "rolled" into the desired cut position. This basic "tip cut" technique is nicely explained in this article. Not to be confused with "regular" bevel edge chisels! Also called the "woodturner's plane" - can create nice surfaces, but prone to "catching" on the workpiece if you're not experienced! Besides the video linked above, you should have a look at this nice writeup on how to control the skew and prevent catches before attempting to use it. Once you get the hang of it, a skew chisel is actually a very versatile tool and can be used for a variety of different cuts. Scrapers are not really used for cutting but have an edge with a burr similar to that on a card scraper. 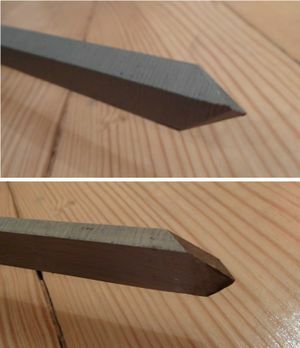 Instead of removing a lot of wood you can use this tool for delicate finishing touches. Read more about this tool here (Doc Green). We have one round nose scraper to start with. In many cases, and when working between centers, it is advisable to turn the lathe off and do the final parting cut with a saw instead. We have a "diamond" parting tool that is tapered behind the edge to avoid binding and burn marks  and one with another geometry. Makezine: "7 Basic Woodturning Tools"
This page was last edited on 8 March 2019, at 23:15.